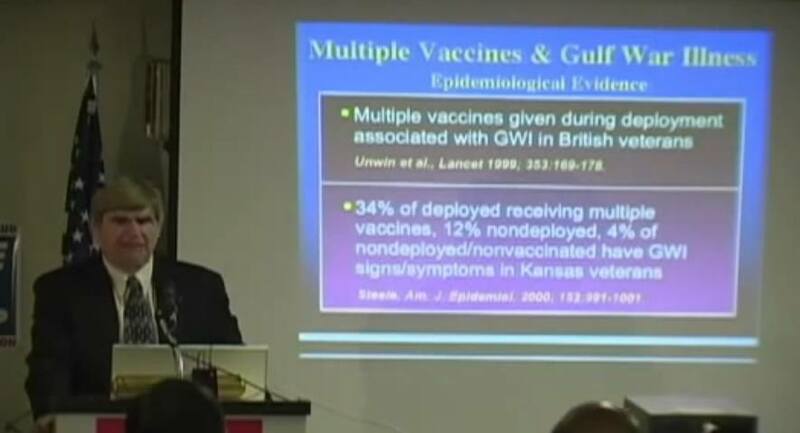 GULF WAR SYNDROME: DOCUMENTS PROVE UK AND US MILITARY PERSONNEL WERE INJECTED WITH UNTESTED VACCINES | "Global Possibilities"
Dr. Garth L. Nicolson, the President, Chief Scientific Officer and Research Professor of Molecular Pathology at the Institute for Molecular Medicine in Huntington Beach, California, lecturing on the connection between military vaccines and Gulf War Syndrome. Image source. In 1990, the recruitment of soldiers commenced for preparation to fight against Iraq in the Gulf War. On January 4, 1991, mass vaccination programs began, supposedly to protect the soldiers against the chemical warfare with which they may or may not come into contact. We know that this list of vaccines should have also included the now discontinued MMR vaccination, Pluserix and the pertussis vaccination. This is because the original supply agreement between the UK government and SmithKline & French shows that SmithKline & French agreed to distribute 1,400,000 Pluserix vaccinations (Urabe MMR) to the UK for use on the UK’s babies and the armed forces. This Agreement’s designated contract reference is N1D0288. 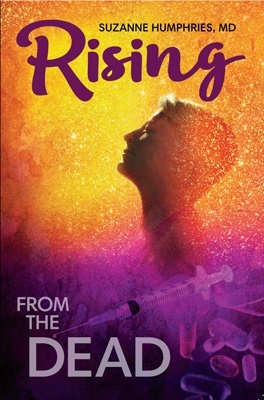 SK&F have agreed to supply and NHS have agreed to purchase for onward sale to United Kingdom Health Authorities and the Armed Forces 1,400,000 doses of “Pluserix” (Measles, Mumps, Rubella) vaccine at a cost of 3.80 per dose (exclusive of value added tax) to NHS of as NHS shall require to facilitate the United Kingdom Measles, Mumps and Rubella vaccination campaign which commences on 3rd October 1988. The supply of vaccine shall be upon the terms of this agreement. Many vaccinations given to the soldiers were both untested and unlicensed. According to research, the UK government felt the necessity to vaccinate their armed forces with vaccinations that were untested and, therefore, potentially unsafe. See: Proof Armed Forces are Given Untested and Experimental Vaccines. When Iraq invaded Kuwait in August 1990, a coalition was initially formed to prevent further Iraqi aggression and subsequently liberate Kuwait itself. From the outset, it was known that the Iraqi regime had been seeking to acquire weapons of mass destruction. The large number of casualties resulting from Iraq’s use of chemical weapons during the Iran-Iraq war of the 1980s, and the attack on Halabja in Northern Iraq in March 1988, showed that Iraq possessed a chemical warfare (CW) capability and that Saddam Hussein was prepared to use it–both in battle and also against large centers of civilian population. The military vaccination program was one of the defense systems that was put in place to protect the UK (and other) troops from both the threat of chemical warfare agents and the weapons of mass destruction that Saddam Hussein was supposed to have and would likely use against them in the First Gulf War. See: Reports and Memoranda- Background to the use of Medical Countermeasures to protect British forces during the Gulf War (Operation Granby). As it turned out, the vaccines that were given to these men and women were probably as dangerous as the chemical warfare would have been, and many of the men and women have since reported lasting effects from the chemicals and toxins with which they were vaccinated. When you read the harrowing stories of what these brave men and women went through, and what they were given to “protect” them from chemical warfare, the true enormity of what these governments have forced their troops to take and the massive impact this must have had on their bodies becomes evident. One veteran, Mr. Richard Turnbull, reported in his witness statement for an Independent Public Inquiry into Gulf War Illness in 2004 that the vaccinations were not given as single injections but in vials that contained two or three vaccinations at a time. I am 52 years old. I served in the Royal Air Force for 18 [sic] where I served at RSAF Dharan in the job of NBC COLPRO, collective protection shelter erection. On 4 January 1991 everyone in the camp at Dharan was ordered to attend for inoculations with the stipulation that non-attendance would be met with disciplinary action. When we attended the next morning for these inoculations, we were given no information at all about what we were receiving. We were given no chance to ask about possible side effects to the massive number of injections they were planning to give us. Were “young men and women who had offered their lives to serve their country” being mass vaccinated by their governments with vaccines previously untested on human beings? The wording of this paper suggests that the soldiers were being given vaccinations that were previously untested on humans. Additional doses would require vaccine production to be rescheduled. A run of experimental Whooping Cough Vaccine would have to be postponed with the approval of the DoH (Department of Health). To speed up this process License Variation or even Crown Privilege would need to be sought. The Ministry of Defence (MoD) paper makes extremely disturbing reading and yet these practices were being used on young men and women who had offered their lives to serve their country. In 1997 the MoD admitted that a facsimile was sent by the Department of Health to the MoD advising the MoD of concerns and anxieties over giving anthrax vaccine in conjunction with the whooping cough (pertussis). At the time of the admission of this fact the MoD stated they did not know who had sent the fax and did not know who received it at the MoD. This was an untruth. The fax was from Dr. Jeremy Metters, Department of Health, to the Secretary of State for Defence. … [Organophosphates] had been purchased in Saudi Arabia with Arabic instructions, which led to the wrong concentrations being put down in troop areas. It is difficult for anyone to truly comprehend what the soldiers endured. It appears that, instead of being protected, these brave men and women were used solely as guinea pigs to test out various vaccines, chemicals and poisons. Is it really surprising that they are suffering ill effects many years later? 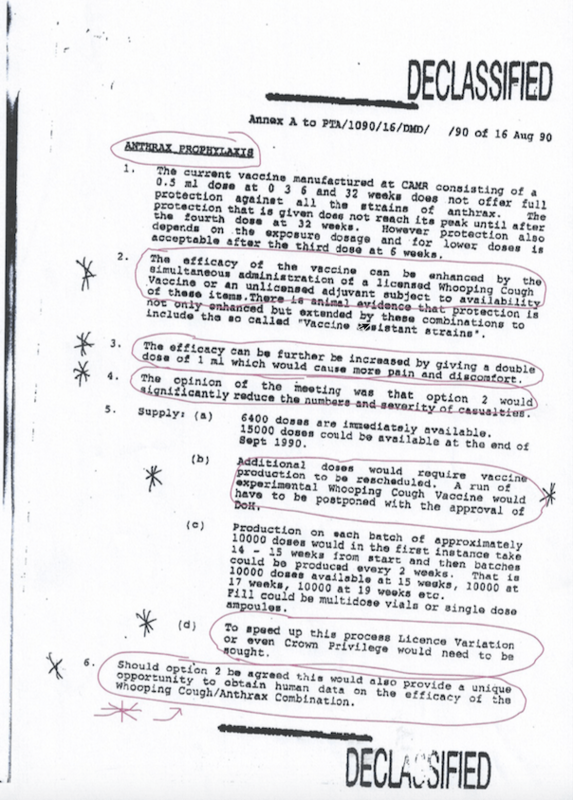 The UK government were not the only government to order their armed forces to receive the anthrax vaccination, as part of their regime. According to the documentary Direct Order, the anthrax vaccination was routinely given to every member of the US military and according to a number of soldiers featured in the documentary, any soldier who refused this particular vaccination could end up in jail for disobeying an order. Since 1998 we have given the mandatory anthrax vaccinations to over 600,000 of our young men and women serving in the military. Extensive research has revealed that many of them have died. Reports are that thousands more are ill.
Doctors say that these people suffer from Gulf War syndrome; the military tells us that is an emotional ailment. We do know that the vaccine given them was not approved by the FDA and we do know that refusal to take the shots has resulted in dishonourable discharge, fines and prison. We do know that mandatory anthrax vaccinations are set to continue. This documentary leaves us in no doubt, that hundreds of thousands of US servicemen and women have been used by their government as part of an ongoing human experiment and a large number of personal testaments, outlined the pain and suffering that this experiment has caused. I didn’t know about the anthrax shots during the Gulf War. In September 99 President Clinton sent executive order 13139 that allows DoD (Department of Defense) to experiment on us without our signed consent or knowledge. The crew were pulled aside and told to march into this tent, they were told that they were going to be given a shot, it was classified, they had to do it livestock and they were not to talk about it and there were not supposed to be any side effects from it and the shot would not be entered in their shot records. Sergeant Moore was one of the many who suffered an adverse reaction from this vaccine. Dr. Garth L. Nicolson is the President, Chief Scientific Officer and Research Professor of Molecular Pathology at the Institute for Molecular Medicine in Huntington Beach, California. He is also a Conjoint Professor at the University of Newcastle (Australia). He was formerly the David Bruton Jr. Chair in Cancer Research and Professor and Chairman of the Department of Tumor Biology at the University of Texas M. D. Anderson Cancer Center in Houston, and he was Professor of Internal Medicine and Professor of Pathology and Laboratory Medicine at the University of Texas Medical School at Houston. He was also Professor of Comparative Pathology at Texas A & M University. Professor Nicolson has published over 640 medical and scientific papers, including editing 20 books, and he has served on the Editorial Boards of 30 medical and scientific journals and was a Senior Editor of four of these. The complete resume of his academic career up to this point is 74 pages in length. Dr. Garth L. Nicolson’s expertise in the area of vaccine contamination was enhanced by being a medical investigator in over 1000 cases of Gulf War syndrome. He was appointed Chairman of the Medical-Scientific Panel for the Persian Gulf War Veterans Conference. He served as authority to the United States House of Representatives, and for his service he was conferred honorary Colonel of the US Army Special Forces and honorary US Navy SEAL. Dr. Nicolson, in a lecture in 2008 which can be found on YouTube, stated that the number one source of Gulf War illnesses were the microbes that military personnel received as contaminates in the vaccines they were given prior to being deployed to the Persian Gulf. Section 1. Policy. Military personnel deployed in particular military operations could potentially be exposed to a range of chemical, biological, and radiological weapons as well as diseases endemic to an area of operations. It is the policy of the United States Government to provide our military personnel with safe and effective vaccines, antidotes, and treatments that will negate or minimize the effects of these health threats. 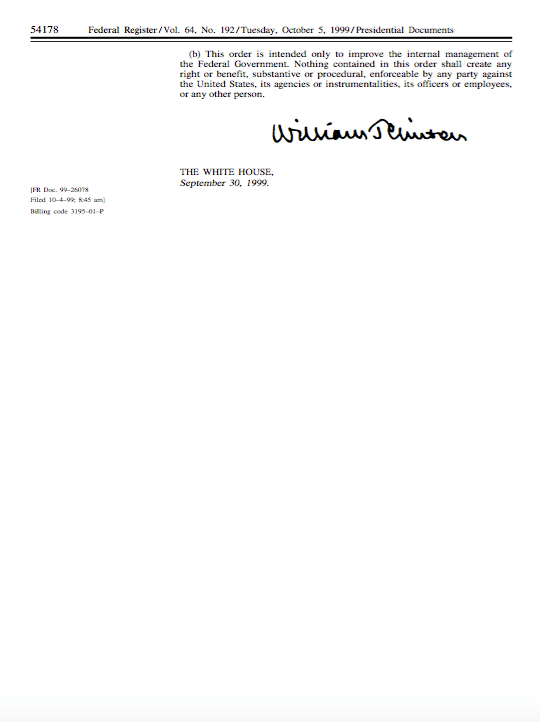 Executive order 13139 – page 1 of 4. Executive order 13139 – page 2 of 4. 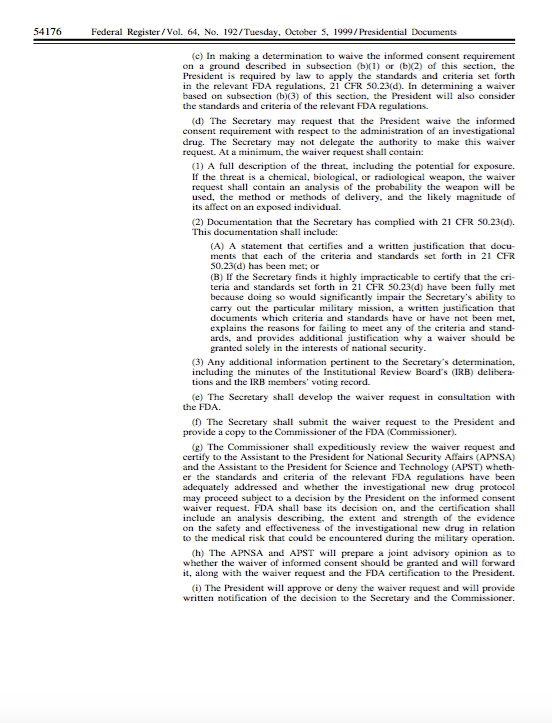 Executive order 13139 – page 3 of 4. 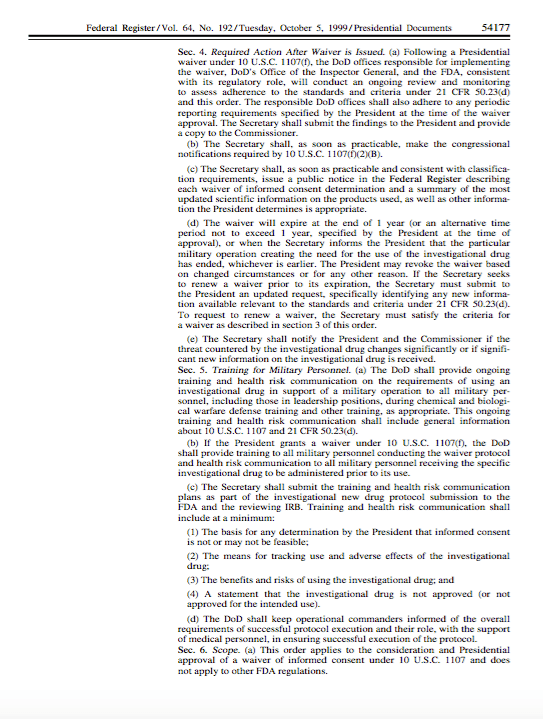 Executive order 13139 – page 4 of 4. 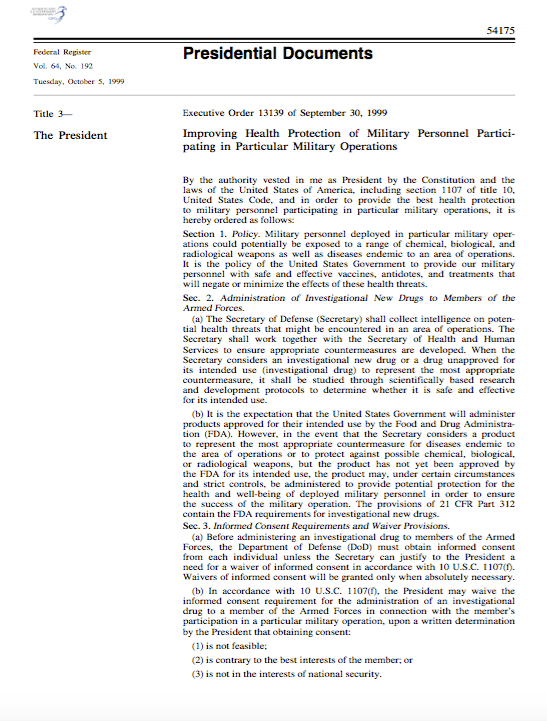 If this is true, then these vaccinations, antidotes and treatments were far from safe, and what we found to be even more shocking was the fact that, section 3 of the document did indeed give the DoD permission to use these “so-called preventions” without the signed consent of military personnel. 6. Vaccinations – Troops sent to the Gulf were given a large cocktail of vaccinations in a short period of time. In total, US servicemen may have received as many as 17 different vaccines, including live vaccines (polio and yellow fever) as well as experimental vaccines that had not been approved (anthrax, botulinum toxoid) and were of doubtful efficacy. In the UK, the Ministry of Defence (MoD) has declared only 10 vaccines given but reports from veterans and official documents seem to tell a different story. A large 2002 study of 900 veterans found a strong correlation between the anthrax vaccine and subsequent ill health. The study indicated that those who received anthrax vaccines reported more adverse reactions than those who did not receive the anthrax vaccine. It also found that the more severe any initial reaction to the vaccine was, the more severe long term health effects were. A lot of recent research has involved studying the effects of vaccines that use pertussis, the bacteria responsible for whooping cough, as an adjunct. It has been proposed that the use of pertussis as an adjuvant could trigger neurodegeneration by increasing secretion of certain immune chemicals, such as interleukin-1beta, in the brain. In turn, brain lesions may be sustained by stress or neurotoxic chemical combinations Pertussis vaccine was used in the gulf “off-label,” which means it wasn’t approved to be used on servicemen as it was. Its use in the Gulf War can thus be classed as experimental. The manufacturers of pertussis were not advised of this unlicensed use. Dr. Philip F. Incao of Denver, Colorado provides what may be an explanation of why some people given this cocktail of vaccinations remained healthy while the health of others was sent into decline resulting in chronic illness. Dr. Incao explains that the immune system and mechanism by which vaccinations work, is much more complicated than was thought until recently. Rather than stimulating the whole immune system against a certain pathogen, vaccinations only stimulate the humoral, or Th2, branch of the immune system which is responsible for producing antibodies that recognize pathogens as invaders. Over activation of the Th2 mediated immune response leads to allergic and autoimmune disease. Dr. Incao suggests that giving vaccinations to people whose immune systems are already Th2 dominant will exacerbate exiting conditions and may lead to what we know as Gulf War syndrome. A large body of research seems to confirm this, showing that those veterans with Gulf War syndrome tend to have an immune system shifted towards a Th2 response. Read a full explanation from Dr. Incao here. 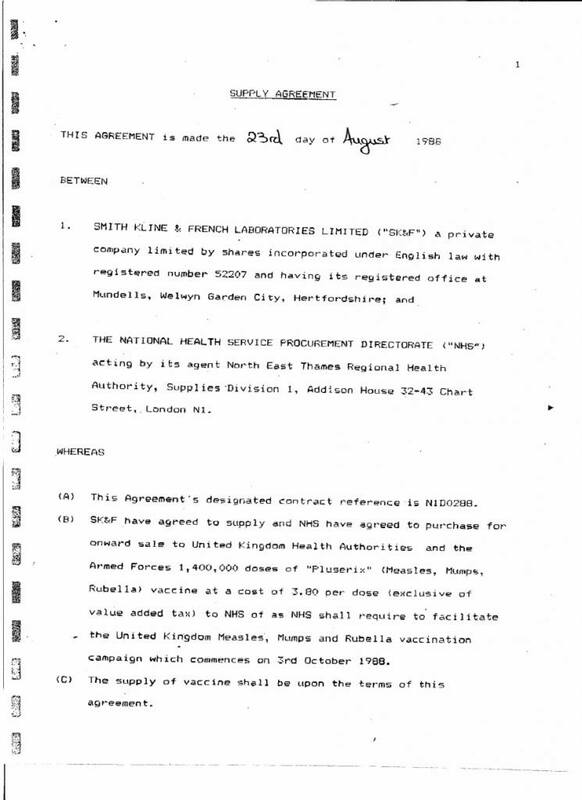 It is clear from all of these reports that large numbers of military personnel, both in the UK and in the US, were given a large quantity of unlicensed and untested vaccinations by their governments, which has ultimately resulted in many of them suffering from long term illnesses, disability and, in some cases, death. For more information, please read Vaccination Policy and the UK Government: The Untold Truth by Research Journalist Christina England and Lucija Tomljenovic Ph.D., available on Amazon UK and Amazon US. As Christina England was writing this expose the past week, Polly Tommey, one of the producers and part of the VAXXED film team, filmed an interview with Sherrie Saunders, a former military medic and now whistleblower regarding military vaccines. Sherrie discovered that the animal protein in the anthrax vaccine was causing Gulf War syndrome in some soldiers, some who even died. When she reported it to her commander, she got a visit from someone in Washington, D.C. and was told to keep quiet about it.